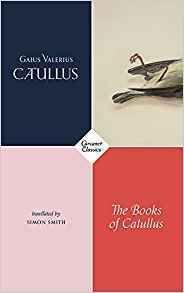 (Carcanet Classics, 2018); pbk £12.99. the grand equation of the sum of our kisses. About it, and you wouldn’t be able to stop. Sickly to look at, but you just won’t own up. Yet the translator is well aware of the risks involved in modernising, in losing sight of the historical distance and the resulting differences. In his introduction, he states that for “the modern-day reader approaching the poem (No.8) anew, unfamiliar with its cultural nuances there is a risk […] (the reader) is lured into an act of cultural appropriation, eliding the poem’s historical reality.” And it is the case that one can easily read Smith’s translations, feel the familiarity of the words yet still perceive the historical distance. Would you have thought to write funny verses about your friend’s amorous adventures? to heaven with the force of my funny verse. Smith has grouped the poems into three books: the “polimetrics” (Nos.1 – 60); the long poems on marriage (Nos. 61 – 64); and the elegies and epigrams (Nos. 65 – 116). What has been said about the translations so far mainly applies to the first book, which is most free and liberal in its approach. But the more traditional translation of the later books feels much more natural to the reader, after having been eased in by the early more accessible verses. It is as if the translator, in a very pedagogical manner, has captured our modern attention with familiar and slightly jarring words and turns of phrases, lured us into reading and accepting other, more old-fashioned lines, and thus has slowly been immersing us in a world of quite unfamiliar words and terms and expressions. When he then moves on to the more literal translations of Book II and Book III, the transition is easy and the modern words, the salacious turns of phrases (try reading No. 16), the familiar expressions are not even missed.